We are an established abnormal load and heavy haulage transportation company, with the capability of moving all types of oversized and heavy cargo throughout the UK and Europe. Our strategically placed depots located in the United Kingdom and The Netherlands allows us to react swiftly to the ever-increasing demands of our clients. We continually build on our vast experience so that we can offer a truly professional service, commencing from your initial enquiry and continuing throughout until your cargo is safely delivered to its destination. Safety for us is of paramount importance, and our dedicated teams have the specialist knowledge needed to ensure your cargo is transported and delivered safely every time, so you can be assured that the correct vehicle and securing equipment are being provided for movement of your cargo, whilst maintaining and adhering to the ever-changing rules and regulations associated with the movement of abnormal loads. So, whether you have a single item, multiple loads or a complete turnkey project that needs dedicated attention, our personnel are on hand at any time with the know-how and expertise to provide you with a bespoke logistics solution whatever the challenge. Our team has years of experience in the haulage industry, and are dedicated to providing the best possible service. 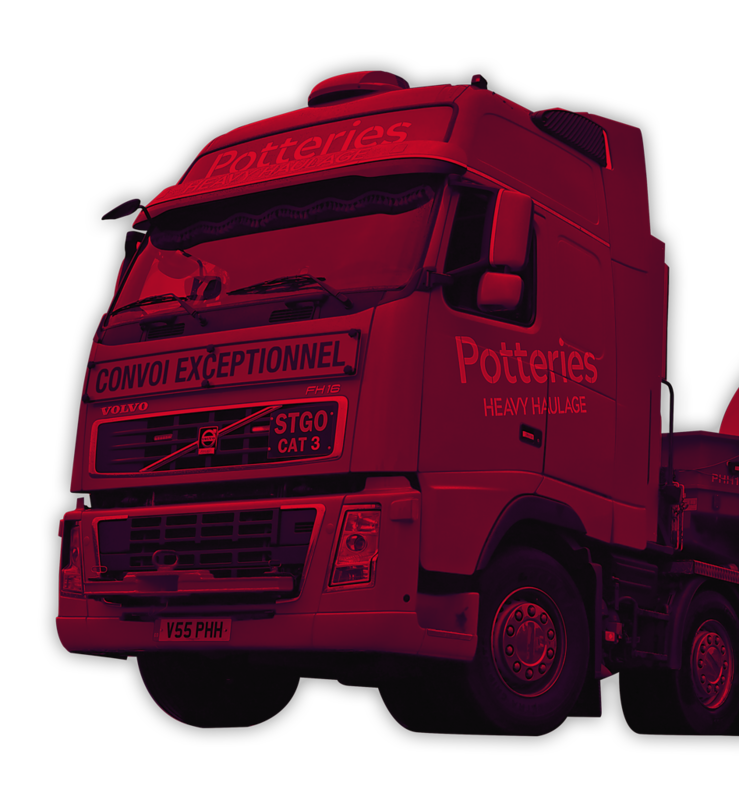 The Potteries team use their enthusiasm and expertise to respond quickly and efficiently to any queries you may have about your haulage needs. Potteries Heavy Haulage recognise the importance of Health and Safety, Quality and Environment, and have implemented an approved quality management system and procedures to ISO 9001:2015 standards. We also have policies in place for Health and Safety, Quality and Environment which are regularly reviewed, updated and signed by the Managing Director, showing the company’s commitment. In addition to ISO 9001:2015 we are now working towards obtaining the ISO 45000 Health and Safety standard to further demonstrate our commitment to staff and clients. We constantly look for ways to initiate improvement within the workplace and have adopted the ‘Plan, Do, Check, Act’ approach to demonstrate that we are constantly improving our systems. Our systems are checked and reviewed by both our customers and accreditation bodies to ensure that we are performing to the highest standards. At Potteries, we pride ourselves on keeping up with the latest technology through regular contact with suppliers and manufacturers to ensure that all our vehicles meet the latest safety and emissions regulations, looking after our staff and the environment in equal harmony. All waste is recycled by our approved recycling companies to minimise waste sent to landfill. Procedures are also in place for the disposal of tyres, waste oils, batteries and other consumables which have reached the end of their lifespan. Our vehicle wash has an interceptor installed to ensure that no contaminates enter the watercourse.